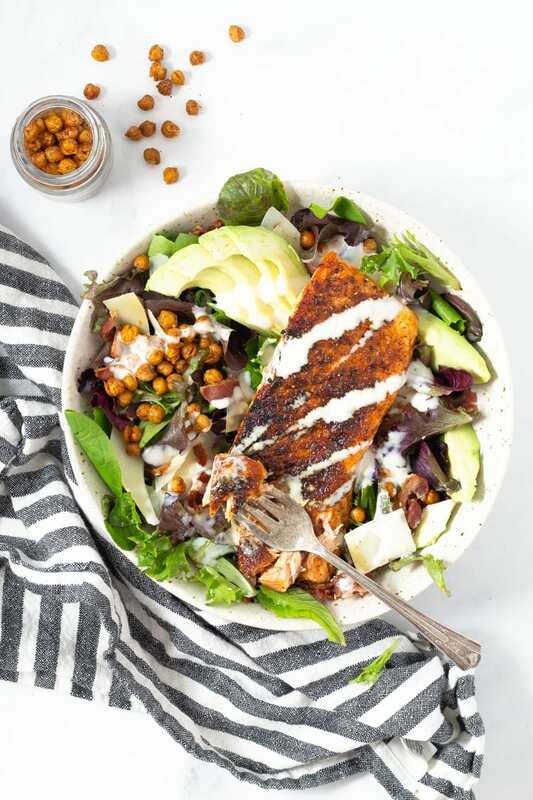 Traditional Caesar salad gets a healthy makeover with seared salmon, creamy avocado and crunchy roasted chickpeas. 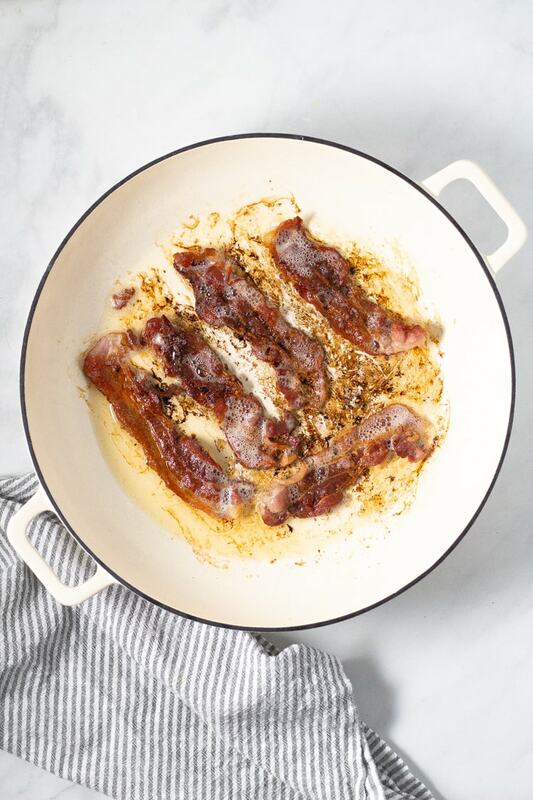 Of course I had to throw a little bit of crumbled bacon on there too, just for good measure! And the best part? It takes just 30 minutes to make! How do I make roasted chickpeas? I use the roasted chickpeas in this recipe in place of traditional croutons. 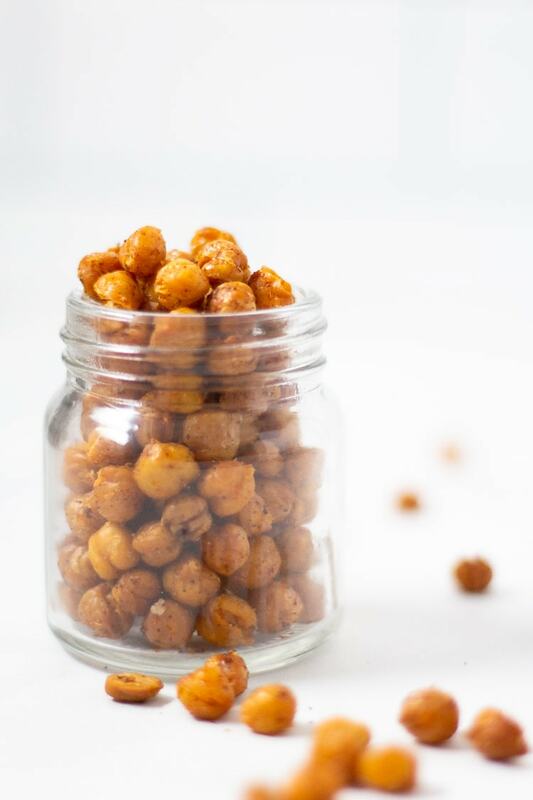 While I love a simple homemade crouton as much as the next gal, I also LOVE LOVE LOVE roasted chickpeas and they definitely add more nutritional value to my diet than diced cubes of bread. You’ll start by tossing the chickpeas in olive oil and salt, then roasting them on a baking sheet in the oven for 20 minutes. Then you’ll add some secret seasonings and bake for another 3-5 minutes until they are dark golden brown and crispy. I might recommend making a double batch of the crispy roasted chickpeas if you’re husband is around and feels like snacking. I made the mistake of making just one batch while I was getting ready to shoot this recipe and barely had enough left to photograph after he was done munching. It’s hard to get upset with someone when they think your food is so good that they can’t stop eating it though, right? It’s basically the best compliment ever! 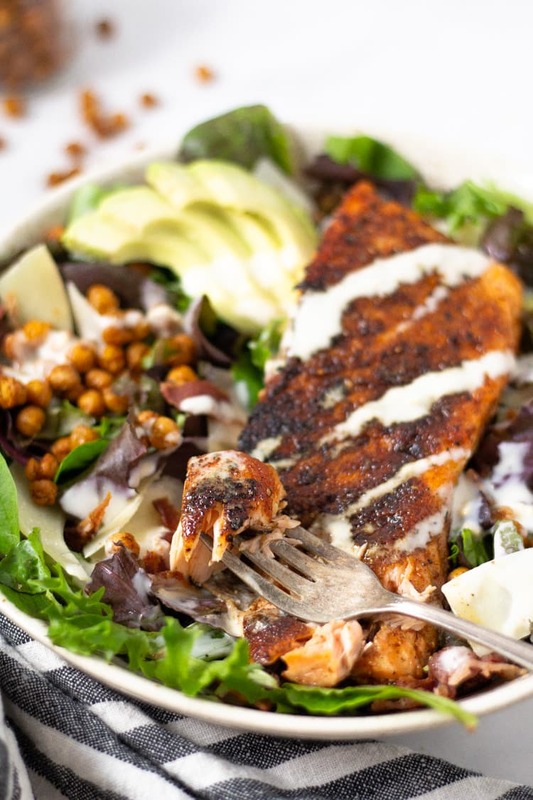 How do you cook salmon for Caesar salad? 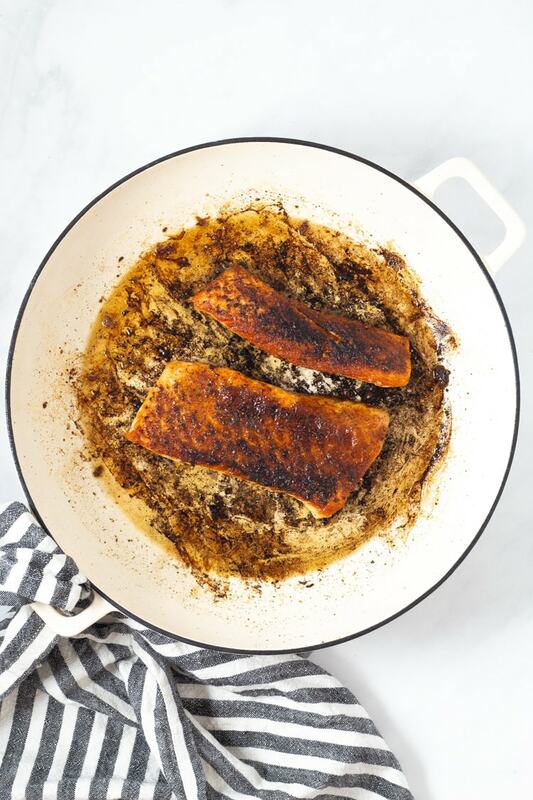 In this recipe we are going to pan sear the salmon giving it a nice crispy crust on the outside, while the fish gets tender and flaky on the inside. Using medium high heat is going to gives us the right temperature to achieve the perfect texture. Olive oil is my preferred sauteing oil, but vegetable oil or grapeseed oil work just fine too. 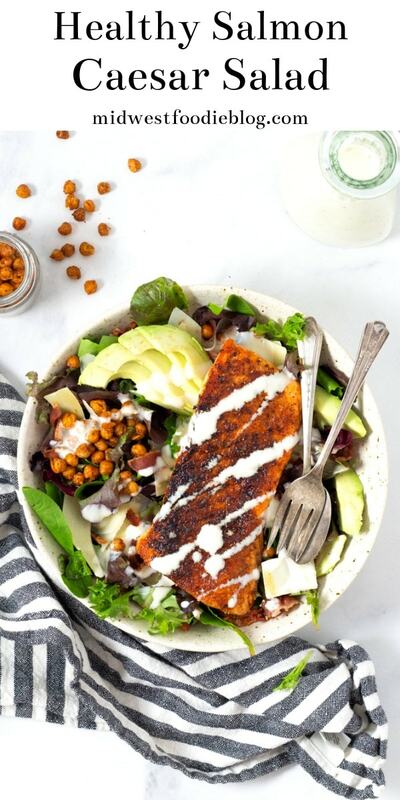 You’ll season the salmon with a bit of paprika and cumin to boost the flavor and give it a little extra color as well. And of course, you’ll season it with a moderate amount of salt and pepper to bring out the natural flavors. Then you’ll sear both sides in the pan – the skin side first for 3-4 minutes, then the flesh side for 2-3 minutes. Be generous with the salt and pepper. In this recipe we add paprika and cumin for a little kick and color, but most often I just sear salmon with good ol’ fashioned salt and pepper. Be liberal in salting and moderate in peppering. Those two spices will really enhance the flavor of the fish. Don’t take the skin off. Crispy salmon skin is delicious! And if you’re not into the skin, it’s super easy to peel off once the fillet is cooked. Start cooking the salmon skin side down. This will allow the skin to crisp up and also make it easier to flip the fish over and cook the other side. If you start with the flesh side down, you’ll have to get the spatula under the delicate flesh side of the salmon which will be much more difficult. Don’t overcook the salmon. When the flesh of the fish flakes easily, you know it’s done. A sure sign of overcooked salmon is when that white substance (albumin) starts to appear on the salmon. A cooked fillet of salmon will have a small amount of albumin, but not much. Use fresh ingredients. Find the freshest fish you can. Use fresh (locally grown if possible) greens or lettuce. Shave or shred your Parmesan cheese fresh from the wedge. The freshest ingredients will yield the best flavor. Use your favorite Caesar dressing. I like Bolthouse Farm Creamy Caesar. 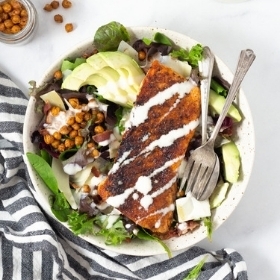 It tastes amazing and it’s also a yogurt based dressing which means the calorie count is much lower compared to most traditional brands of Caesar dressing. Make sure your avocados are ripe. Did you know that the best way to quickly ripen avocados is by placing them inside a paper bag? You can use a brown paper lunch bag or grocery bag, just make sure you fold the top over a few times so that no light gets in. This will speed up the ripening process and you’ll have a ripe avocado in a day or so. 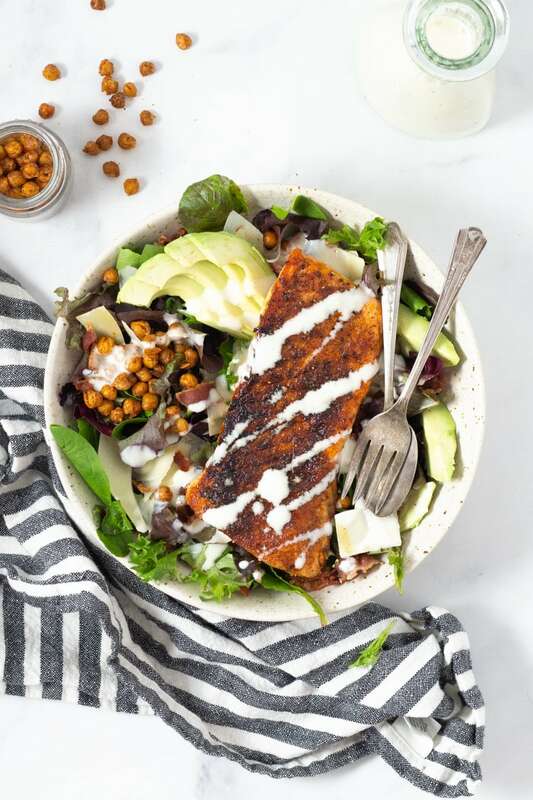 Traditional Caesar salad gets a healthy makeover with seared salmon, creamy avocado and crunchy roasted chickpeas with a low calorie dressing! Heat oven to 450 degrees. Line a baking sheet with parchment or foil. Place dried chickpeas in a medium bowl and add 1 tablespoon olive oil and 1/2 teaspoon Kosher salt. Toss to coat evenly. Spread in a single layer on the lined baking sheet. Roast for 20 minutes then remove from oven and sprinkle with paprika, cumin and garlic powder. Stir to evenly coat chickpeas with seasoning. Roast for an additional 3-5 minutes but keep a close eye on them as they can burn quickly. Heat olive oil in a large saute pan over medium high heat. Season flesh side of salmon with paprika, cumin and a moderate amount of salt and pepper. Cook salmon skin side down for 3-4 minutes. Flip and cook the other side for 2-3 minutes or until a dark golden brown crust has formed and the salmon flakes easily. Divide lettuce, bacon, chickpeas and Parmesan between the 4 plates. Lay a fillet of salmon on each salad. Drizzle with dressing and serve! The perfect healthy meal prep recipe for the New Year!